Human amniotic epithelial cells (hAECs) which are isolated from the amniotic membrane have stem cell-like properties and immunomodulatory effects. Several protocols have been proposed for isolation of hAECs, nevertheless, there is no report concerning isolation of highly viable hAECs, with desirable yield, and without significant purity reduction. In the current study, a detailed protocol with some modification of previous ones is presented in which the amendments led to isolation of hAECs with high purity, yield and viability. Moreover, isolated hAECs were subjected to immuno-phenotyping and their physiological status was assessed using a proliferation assay. The average yield of obtained hAECs using the new modified method was 190 × 106 cells with a mean viability of 87%, with less than 1% contamination with mesenchymal stem cells (MSCs). The isolated cells were > 95% positive for the epithelial cell markers. The lowest initial plating efficiency of the cells was 80%. Freshly isolated hAECs had the ability to proliferate for 5–6 passages in a standard culture medium. Human placenta consists of three layers including amnion, chorion and deciduas . The amnion layer, which is derived from the embryo, is the closest layer to the fetus and consists of both cubical and columnar epithelial cells [2–4]. 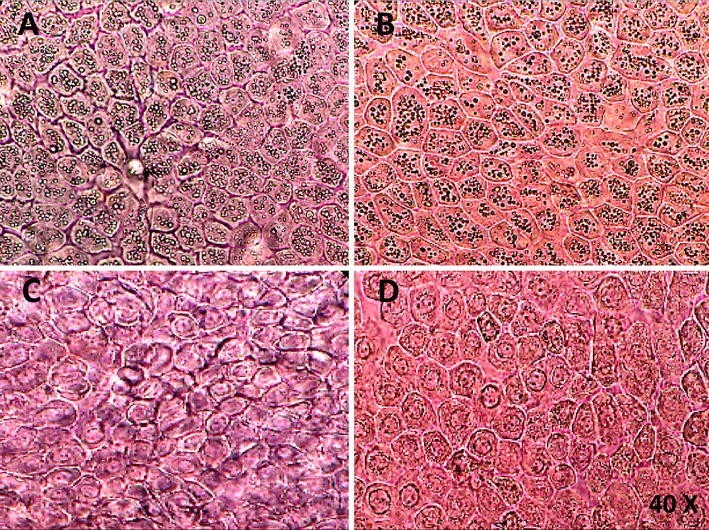 These human amniotic epithelial cells (hAECs) have unique properties that distinguish them from other human cell types including immunomodulatory effects and stem cell-like features which provide capability to differentiate into different cell types originating from three germ layers without any of the ethical concerns related to human stem cells [1, 5–8]. In addition, no tumorigenicity and transplant rejection were observed upon hAECs transplantation [1, 9]. Therefore, hAECs could be safely employed in regenerative medicine and treatment of diseases with immune pathophysiology. Until now, several protocols were reported by which hAECs were isolated with the average yield ranging from 8 × 106 to 120 × 106 cells and a viability of 83–98%. The isolated cells were positive for the epithelial cell markers in range of 83–98%, while contamination with MSCs was among 1–80% [3, 10–15], nevertheless, as mentioned in Table 1, no report is available concerning isolation of highly viable hAECs with desirable yield and without any significant purity reduction. In this study, a detailed protocol with some modification of previous ones is presented in which by using the new modified method hAECs were isolated with high yield, viability and purity with the minimum contamination with other cell populations. In addition, the isolated hAECs were subjected to immuno-phenotyping, and their physiological status was assessed using a proliferation assay. Sean V. Murphy et al. All deliveries which were positive for infectious agents including HBV, HCV and HIV and those with pre-diagnosed genetic abnormalities were excluded from this study. Full-term human placentas were obtained from six healthy women with a normal singleton pregnancy undergoing uncomplicated elective cesarean section. All the materials and equipment used in this procedure were sterile. DMEM/F12 (Gibco, Thermo Fisher Scientific, USA) supplemented with 10% FBS, 100 U/ml penicillin, 100 μg/ml streptomycin (1X, Sigma Aldrich, USA) and 10 ng/ml EGF (Thermo Fisher Scientific, USA) was used as standard culture medium. To prepare 1000 ml of 1X Pre-digestion buffer, all the components mentioned in Table 2 were added to 900 ml of tissue culture-grade water (20–25 °C) and the pH was adjusted to 7.2 (It is because pH of the buffer rises up to 0.1–0.3 units during filtration). Thereafter, tissue culture-grade water was added to the solution and the final volume adjusted to 1000 ml. The buffer was immediately sterilized by filtration using a 0.22 µm filter (Thermo Fisher Scientific, USA) and stored at 4 °C for further usage. The placenta was transferred to the laboratory in a sterile container which was filled with ice-cold Hanks’ balanced salt solution (calcium- and magnesium-free HBSS) or RPMI/1640 (Gibco, Thermo Fisher Scientific, USA) containing 1% penicillin/streptomycin solution (Sigma Aldrich, USA) to cover up the placenta surface. 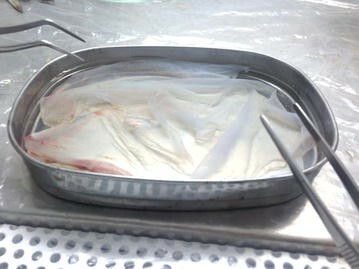 The placenta was placed in a sterile container (under a horizontal laminar flow hood) while the amniotic membrane was faced up (Fig. 1). The amnion membrane was manually stripped from the chorion layer, starting from the outer edge of the amniotic membrane and continuing towards the umbilical cord (Fig. 2). The membrane was washed several times with ice-clod PBS (pH 7.2) to remove blood clots, torn pieces and cellular debris (Fig. 3). Blood-free amnion was cut into pieces around 7 cm long and transferred with forceps to two new 50 ml falcon conical tubes. To each tube 20 ml pre-digestion buffer was added, and then incubated at 37 °C for 15 min with gentle shaking (30–60 RPM). Afterwards, the amnion pieces were transferred into three new 50 ml falcon conical tubes containing 20 ml of pre-warm 0.05% trypsin/EDTA (Thermo Fisher Scientific, USA) and incubated at 37 °C for 10 min with gentle shaking (first digestion). The obtained cells at this step were discarded to exclude blood clots and cellular debris and the membrane pieces were transferred into new tubes. The enzymatic digestion was followed by addition of 20 ml pre-warm 0.05% trypsin/EDTA and incubation at 37 °C for 30 min with gentle shaking (second digestion). This step was repeated, then the second and the third digestions were neutralized for trypsin activity by adding 30 ml HBSS, and finally centrifuged at 200×g for 5 min at 4 °C. The cell pellets were re-suspended in 10 ml standard culture medium, mixed together and filtered through a 100 μm cell strainer (Thermo Fisher Scientific, USA). The filtrate cell number was counted using a haemocytometer and cell viability was determined using trypan blue dye exclusion. It is possible that the amnion layer is peeled off from the chorion in the operating room, which has its advantages including: using less transportation medium, minimize possibility of non-sterile samples, and decreasing the amnion contamination with blood clots. It is recommended that before hAECs isolation, a piece of the amniotic membrane be observed under an optical microscope (40 × magnification) in order to check the status of the cells. An amniotic membrane with epithelial cells, which are notably vacuolated in their cytoplasm, is not suitable for cell isolation (Fig. 4A, B). Do not process to the next steps. It is suggested that the status of the remained cells on the amniotic membrane after each digestion step be checked under an optical microscope and the membrane with highly vacuolated cells is discarded. Checking a piece of the amniotic membrane under a microscope after each digestion step also helps to realize whether the next-step of enzymatic digestion is required or not. Accordingly, the number of required digestion steps to separate majority of the cells from the membrane may be increased or decreased. It is suggested that at the end of each digestion, the membrane pieces be gently shacked using a forceps in 50 ml tubes containing the trypsin digest to separate all the epithelial cells in case still be (loosely) attached to the membrane. The purity and phenotypic characteristics of freshly isolated hAECs were determined using flow cytometry. The cells (4–8 × 105) were stained with different antibodies (Table 3) or matched-isotype control IgG at 4 °C for 25 min. Matched isotype control antibodies were used as negative controls and MSCs were employed as positive control for anti-CD90 and anti-CD105. Afterwards, the cells were washed three times using cell staining buffer (Biolegend, USA) and centrifugation at 200×g for 5 min at 4 °C. Intracellular staining with FITC-conjugated–anti-cytokeratin (Biolegend, USA) was performed after fixation and cells permeabilization according to the manufacturer’s instructions (eBioscience, USA). The data was acquired using a FACSCalibur system (Becton–Dickinson, CA) and analyzed using CellQuest software (Becton–Dickinson, CA). Isolated hAECs were cultured in 75 cm2 tissue culture flasks at a density of 2.5 × 105 cells/cm2 using standard culture medium, and then incubated at 37 °C with 5% CO2. The initial plating efficiency of the cells was determined after 2 days of incubation. The hAECs were dissociated using 0.05% trypsin–EDTA solution, whenever they were approximately 80% confluent. The cells were sub-cultured in 1:4 ratios in standard culture medium. The average yield of obtained hAECs by this method was 190 × 106 cells with a typical range of 90–280 million cells (Fig. 5a). Noticeably, for this yield the average obtained viability was 87% (ranging from 83 to 89%) (Fig. 5b). The hAECs purity achieved by this protocol was at least 95.42%, as confirmed by cytokeratin analysis, an epithelial cell marker (Fig. 6a). Less than 1% of the isolated cells were positive for MSC markers (CD90, CD105) (Fig. 6b, c). In addition, hAECs immuno-phenotyping from different donors showed that the isolated cells were almost a homogenous population (Table 4). After 48 h, the initial plating efficiency of the isolated hAECs on culture dishes was at least 80% (Fig. 5b). Freshly isolated hAECs had the ability to proliferate for 5–6 passages in standard culture medium. In contrast with some reports [5, 16], hAECs which were cultured without EGF were not able to proliferate at all. hAECs are a type of stem cells isolated from the amniotic membrane of the placenta. In addition to stem cell-like properties, which proposed hAECs as a potential candidate for regenerative medicine, it has been shown that they can be used as an immunomodulatory agent in treatment of diseases with immune pathophysiology. hAECs isolation from the amniotic membrane is performed with enzymatic digestion of the amniotic membrane, since amnion epithelium is a single monolayer with a weak cell–cell adhesion at the lateral sides and trypsin is able to separate hAECs from the amniotic basement membrane . There is a notable variability in the purity, yield and viability of hAECs isolation using previous protocols [3, 10–15]. These variations might be related to several factors including mother related parameters (e.g. age, gestational week and delivery type), size and quality of the placenta (which is affected by duration of the time between the delivery and hAECs isolation), transportation condition (such as cold chain), residual blood on the tissue (in spite of extensive washing), type and concentration of the enzyme solution, and enzymatic digestion time [3, 10–14]. A disadvantage of these methods for cell isolation is that achieving a desirable yield come at the expense of losing the cell viability and purity. The presented protocol at this study resulted in hAECs isolation with high yield (to our knowledge, the highest yield reported yet), viability and purity. Using the proposed modified protocol, an average yield of 190 × 106 hAECs (in range of 90–280 million cells) was achieved compared to the average yield of 8 × 106–120 × 106 cells obtained using previous protocols [3, 10–12, 14, 15]. Regarding the fact that a consistent protocol was followed for hAECs isolation from all donors in the current study, the observed extensive variability in cell yield might be related to quality of the placenta obtained from different donors. The mean viability of isolated hAECs in this study was 87%, compared to previously reports with a range from 83 to 99% . Previous methods reported that high yield of the viable cells was accompanied contamination with other cell populations [10, 11, 14]. However, the current study reported a highly viable hAECs at high yield and minimum contamination with MSCs. These findings could be mainly attributed to two factors, a shorter incubation time compared to previous protocols and discarding the first digestion. Regarding the facts that a part of blood clots and cellular debris are not removed after extensive washing of the amniotic membrane with PBS, consequently these parts are separated from the membrane in the first step of digestion. The initial plating efficiency of the cells in the current study was at least 80% after 48 h, moreover the cells continued to proliferate for 5–6 passages in standard culture medium. It is found that in addition to the initial viability of the isolated cells which is an essential factor for determining long-term survival of hAECs and their proliferation, the initial plating efficiency is critical as well. According to the results, isolated hAECs from different placentas were highly homogeneous based on the expression of epithelial (cytokeratin), MSC (CD105, CD73, CD90), embryonic stem cell (SSEA-4), hematopoietic stem cell (CD34), and immunologic (HLA-DR, CD56, CD3, CD4, CD8) markers and adhesion molecules (CD29). However, there were differences in the level of CD9, CD14 and CD44 between different donors. In summary, using the new modified protocol a high hAECs yield with high viability and purity was obtained, and the cells kept their proliferation ability until passage 5–6. A limitation of this technique is that increasing the cells yield may result in losing the viability, purity and initial plating efficiency. HM, SG carried out the experiments and preformed statistical analysis. NE participated in the design of the experiments and obtained funding for the work. NT participated in the study design. 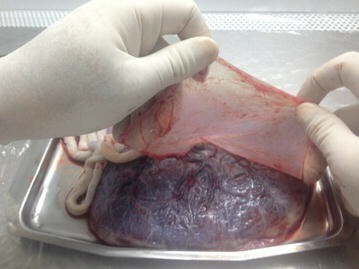 FK, BK provided the placenta tissue and participated in the design of the experiments. AR drafted the manuscript and participated in the study design. All authors read and approved the final manuscript. The authors thank all individuals who participated in this study. This study was approved by the Ethics Committee of Isfahan University of Medical Science. All contributors signed informed consent before entering the study.